Bollards are a useful tool in traffic flow management; they help save lives by protecting pedestrians and others who use city walkways. Illuminated bollards offer security and lighting, making our streets and sidewalks safer. Illuminated glass fiber reinforced concrete (GFRC) bollards by Stromberg offer protection for people and businesses. Illuminated bollards are strong enough to stop cars and trucks traveling at high speeds; in this way they protect life and property. GFRC illuminated bollards can be installed in any setting including airports, office buildings and even embassies and military bases around the world. Illuminated bollards will let your customers know where to park too. Stromberg makes illuminated bollards in a variety of designs to fit the surrounding area. GFRC illuminated bollards are easy to install, durable and weather resistant. Glass fiber reinforced concrete is a lightweight material, but one that lasts a long time, is moisture resistant and also fire resistant. Stromberg has 30 years of experience working with GFRC and can fashion attractive illuminated bollards that will complement the outside décor of your business establishment. Whatever kind of business you have, GFRC can be used to fashion illuminated bollards that will last and perform well. Glass fiber reinforced concrete is the best choice for your illuminated bollards since it’s made with glass fibers instead of steel. Because of this it is much less likely to rust; GFRC can be expected to last as long as pre-cast concrete. GFRC is made from minerals that won’t burn. It acts like a thermal regulator when exposed to flame and protects the materials behind it from the heat of the flame. These qualities make GFRC an earth-friendly product. Because of GFRCs lightweight qualities, installation of your illuminated bollards is quick and easy. Stromberg uses molds to cast your bollards into any shape you want, so you have complete design freedom. 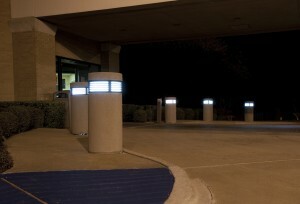 GFRC illuminated bollards come in a wide variety of textures, finishes and colors. The professionals at Stromberg Architectural Products will work closely with you on your illuminated bollard project to see it through to its completion. Stromberg is here to help with CAD details, design assistance and specifications. Contact them today at (903) 454-0904 for a free custom quote and put their 30 years of experience to work for you.